I run. In the woods I feel like an animal. My kind of trail running isn’t a path with woods on either side, it isn’t a paved bike lane along some river—my kind of trail run is a narrow path that forces me to engage both my feet and my mind; and in turn my heart and my soul are engaged just as much. West Virginia is known for some epic trails, hiking and mountain biking—from our camp site there was a small trail that was meant for a walk or a hike, measuring, according to the sign, 1.1 miles—not far at all. But if you remember, I’ve been out for 12ish weeks and any kind of run was going to satisfy my itch to ‘float’ over rock and root. I set out to run, I ended up running, walking and absorbing the woods for all they had to offer. Imagine a field full of tents, music blasting from across the field and then enter the woods and there is literally a line you can cross that shuts all that off. Your senses shift and change as you approach a bridge that lets you cross a stream. You walk over the wooden bridge and it’s like someone hit the ‘mute’ button on reality and turned the volume up on a nature—this is exactly what happened. The only sounds after I crossed the bridge were chipmunks leaping out of the way, a few birds and my labored breathing. The 1.1 mile loop had an ‘approach’ and the real loop was .8 miles—short but tough. Hills, mud that made me slip up and down hill, roots, branches and logs to leap over…this was the trail running you see in a The North Face advertisement. I vow to never stop exploring and press on through the loop 1, 2, 3, 4 times. Solid. For the first time I was wearing a pair of shoes that are considered ‘barefoot’ for their intended purpose on the trail. I’d never worn them in the woods, these shoes connected me, forced me to feel the earth under my feet and allowed it to radiate up my body and pulse through my blood. As I finished my run I had nothing but a grin on my face and sweat dripping all over my body, (WV is hot and humid when it wants to be.) I emerged from the woods to see my new friends grinning back, Alan, Lauren, Josh, Adam and Steve—they could sense the joy I was feeling and were rearranging their cars, ready to go hike and climb and inviting me to do the same. Even if there had been time for a shower there wasn’t one available; this was the beginning of my showerless week. I washed my face, threw on some yoga pants and joined them to explore WV some more. I’ve never been rock climbing but this post makes me want to try it! It sounds like you’re enjoying some great experiences. Great post! I love trail running too, and barefoot running. 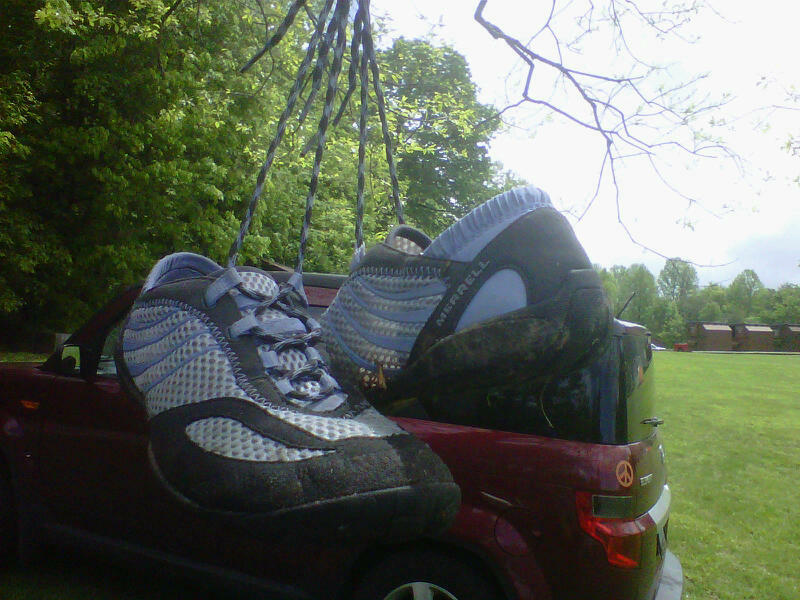 What do you think: is trail running a better experience with your Merrells than totally barefoot? Best wishes from a fellow barefooter in Denmark, Europe. Thanks for reading! Ya know, I’ve never actually gone trail running totally barefoot! I’m still new to the whole concept and really easing myself into to avoid re-injury–could be fun! I do love getting muddy. There’s somthing super satisfying about coming out of the woods covered in dirt and mud! Happy running and thanks for commenting and reading!